MONROEVILLE – Everything except the desired bounce. That’s the way it was for Johnny Diehm and Seneca East in falling to Ashland Crestview 52-51 in overtime in the opener of the Division III boys sectional basketball tournament at Steve Moore Court here Wednesday night. Diehm made a slick move out of a timeout with seven seconds left to slip inside Crestview’s zone for short look in the key, but his shot just ahead of the buzzer hit the back of the rim and bounced away. It was at that point that Crestview coach Shawn Spencer’s heart moved from somewhere in the stomach region back to its proper position. “We wanted to put Johnny in that situation to make a play and he did,” Seneca East coach Todd Aichholz said. “He got the shot that he wanted and he’ll make that shot most of the time. Sometimes you don’t have control over which way the ball bounces. We’ll take that shot every time. Nick Leeper’s two foul shots with 17 seconds left provided the winning margin in an overtime that saw the lead change hands three times. Diehm’s backdoor pass to Alex Forehand for a baseline drive 13 seconds into the extra session started things. Then Crestview’s Colton Stevens, the game’s top scorer with 22 points, hit his sixth 3-pointer of the night. The Tigers’ Tyler Turek hit two foul shots with 2:04 left to regain the lead and the two teams missed a couple opportunities each before Leeper hit the winners. Seneca East spotted the Cougars a 9-0 lead in the first 3:20 as Stevens canned a couple 3-pointers and Avery Baith added another. 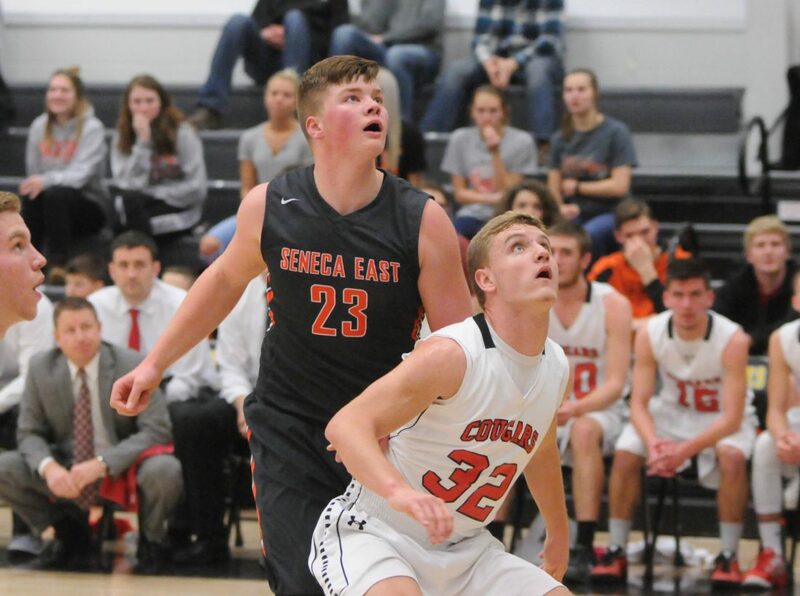 It was 12-4 – Dustin Bond also hit a 3-pointer – before Diehm managed a drive for Seneca East’s first field goal with 55 seconds left in the first period. The Tigers trailed 12-8 at the break but they were already in bonus free-throw position. One of those missed opportunities — they didn’t get to the line again in the first half, which ended on Steven’s buzzer-beating 3-pointer to finish a final-minute possession for a 25-18 lead. Crestview twice led by as many as 10 in the third period as Stevens sandwiched a pair of 3-pointers around one by Seneca East’s Chase Chapman for leads of 32-22 and 35-25, the latter margin coming with 5:06 left in the quarter. It was at that point that Aichholz shifted the defense to a box-and-1 with sophomore Clint Wurm assigned man-up duties on Stevens. It was a turning point for the Tigers as Stevens didn’t score again until his overtime 3-ball. At the offensive end, Diehm and junior Alex Forehand got it going and, the rally was on. Forehand (14 points, 13 rebounds) scored on a baseline drive and passed inside to Turek for another score. Diehm, who led SE with 15 points, added a couple drives to pull to within 37-33. But the margin went to seven when Dawson LaFever hit a 3-pointer at the buzzer to make it 40-33. Forehand and Mykah Vogt (eight points, 10 boards) each hit 3-pointers, Diehm had a three-point play and Chapman scored in transition to tie the game at 44-44 with 4:06 to play. Nic Stimpert, who scored all 10 of his points in the second half, hit a couple free throws and Christian Durbin added another for a 47-44 Crestview lead. But Vogt made one and Diehm calmly hit a pair from the line with five seconds left to send the game to overtime. “Crestview doesn’t have a good history of winning ballgames let along a tournament history and so we had some guys who maybe tightened up a bit,” Spencer said. “We’re not used to winning — I think we’ve won maybe two tournament games in the last 10 years, 15 years. Meanwhile, Seneca East bows out at 9-14. “We fought back and played with a lot of emotion tonight,” Aichholz said. “We had a few turnovers down the stretch and a few shots we didn’t get to fall that we had good looks on.